THE ISLAND THAT TIME FORGOT! Wreathed in mist and veiled in mystery, Monster Island was bad enough during the BIG ONE, when it held cannibal soldiers sworn to kill and die for Hirohito, and savage tribes who worshiped Golyeong, the MIGHTY "gorilla ghost." After the Serpentfall, who knows what TREMENDOUS horrors might be RISING UP in Monster Island's jungles, awakened from the prehistoric past? MASSIVE statistics for five GIANT monsters, six deadly dinosaurs, and three more mysterious foes! Three HUGE volcanoes, a TOWERING plateau, and many more adventurous locations, mapped and trapped and ready to go! A truly COLOSSAL showdown adventure -- "Deploy All Monsters!" 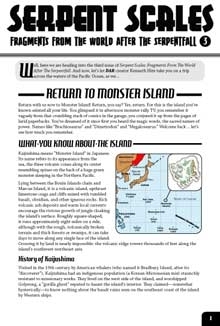 VASTLY useful game-building tools and advice, including the Top Five Other Places to Fight Dinosaurs, a QUITE FRANKLY EXCESSIVE Monster Island Encounter Generator, and tips on moving Monster Island into your own campaign! There are a thousand tales to be told in the world of The Day After Ragnarok, some big and some small. Serpent Scales is an ongoing series of articles shining some light into the interesting little corners of the world after the Serpentfall. These smaller articles will cover the people, places and things of the post-Serpentfall world that are just a bit too esoteric for a full supplement. Sizes and prices will vary for each issue. But don’t worry, playability and usability are our top priority, no matter the length. All killer, no filler. This title was added to our catalog on June 15, 2010.